For most people, their car is their second largest investment next to their home. How do you get the best return on your investment? By keeping your car through the ‘Cinderella Era’, the period of time after it’s paid off when your car is still in great shape and needs only modest repairs. Budgeting for and performing proper scheduled maintenance is the smartest way to get the most from your investment, but how do you know when to keep investing or if it’s time to let it go? When the time comes when you are faced with a larger repair bill, how do you know when to go ahead with repairs or start car shopping? Do the math and weigh the options. Is the repair less than a few months of car payments on a new or used car? How long will the repair add to the life of the car? If a $1000 repair is going to extend the life of your car longer than you would pay a total of $1000 in car payments it may be a good financial decision to repair. A repair bill now can be a drop in the bucket when you compare it with a new monthly bill for the next several years. Is it worth putting so much money into a car of this value? That $1000 can be worth doing, even if the car is only worth a few thousand dollars. A good rule of thumb is to compare the cost of the repairs to the car’s Edmunds or Kelley Blue Book value. 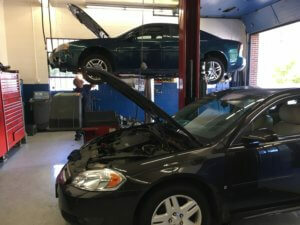 If the repair is less than half the car’s value it may be the best financial option. Consider the total sum it costs you to keep your car per year versus a new one. Edmunds.com says that the average monthly new car payment in America right now is $479. That’s a total cost of $5748/year. Even if you buy a less expensive used car for around $300/month, you’re still shelling out $3600/year. If annual maintenance and repairs on the car you already own come to less than that you are likely coming out ahead. Add in the higher cost of insurance and higher property taxes that generally come with a new car and repairing your old one can be an even more attractive option. Repairing your old car can also keep you from making a hasty purchase earlier than you planned on or before your budget allows. Having an honest, quality mechanic like the certified technicians here at Hillside Automotive maintain your car can add years of life and dependability to your vehicle. Do the math, and that repair estimate may not be a reason to jump into a new car loan and years of monthly payments.